Protect you and your family from cell phone radiation! Keep away harmful radiation from your brain and daily life! COMBO Radiation Sheild & Free Bonus Round E.M.W. absorption device. 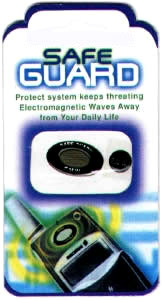 Safe Guard Radiation Protector will protect your from harmful radiation waves. These Shields are not only for Cell Phones. They can also protect you when attached to Two Way Radios, PDA's, Walkie Talkies, Beepers, and even Cordless Phones in your house. The Safe Guard features a soft comfort cushion design that adheres to the ear piece of any mobile or cordless phone and acts as a protection system. 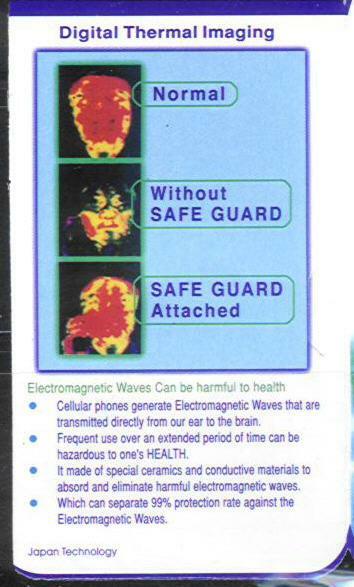 The Safe Guard is made of special ceramics & conductive materials to absorb and eliminate up to 99% of the brain-harmful electomagnetic waves emitted by all mobile cellular phones. It blocks near field radiation from entering the soft tissue of the ear; without affecting the quality of the transmission. Electromagnetic radiation may enter the unprotected area of the inner ear when phone is in use. Electromagnetic radiation is blocked from the soft tissue of the ear canal when the Wave Shield is attached. BONUS: There is a smaller round E.M.W (Electromagnetic Waves) absorption device that you can also place anywhere on your phone, preferable in the back of the headset. Sorry - out of stock. New stock arriving mid April. You can make your order now & your Safe Guard will be sent out as soon as it arrives. Cellular phones generate Electromagnetic Waves that are transmitted directly from our ear canal to the brain. Frequent use over an extended period of time can be hazardous to one's HEALTH. Safe Guard is made of special ceramics and conductive materials to absorb and eliminate harmful electromagnetic waves. 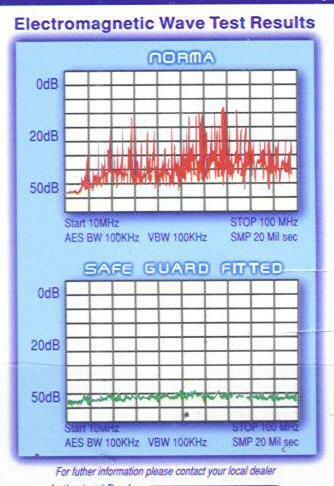 Save Guard is able to filter 99% of the harmful Electromagnetic Waves emitted from the ear piece of cellular phones. * Protect yourself and loved ones from these potentially dangerous health threats. There has been considerable publicity in recent years concerning the very real fears of medical authorities around the world that electromagnetic waves, which emanate from mobile and cordless phones, may well be the cause of brain tumors and other very serious aliments of the head and ears. The Safe Guard Absorbs between 80% to 99% of induced electromagnetic waves and actually improves reception sensitivity during phone use, It is an everlasting gold plated, high performance product and attaches to the earpiece of your phone by a selfadhesive pad. Safe Guard was tested by Allgon Mobile Communications from Sweden with excellent results. Please see the chart above. Additional testing was performed E.M.C. Ltd. supervised by The Israeli Standards Institute, also with excellent results. The efficiency of the Safe Guard as far as a radiation protection is concerned is 14db, ie, one fifth of the radiation without protection. These radiation protectors are not only for Cell Phones... They can also protect against the radiation from Two Way Radios, PDA's, Walkie Talkies, Beepers and Cordless Phones. Small size & lightweight high performing product. Applicable to any material of applications by strong selfadhesive pad. Remove atmospherics distortion by amplifying the receiving electric field. 2) Remove Safe Guard from package. All Done! Easy and Simple! "We now have some direct evidence of possible harm from cellular phones," - Dr. George Carlo (cellular industry researcher) - ABCNEWS' 20/20.